From the opening moments of this CD, I knew I was about to encounter something special. W.C. has chosen the Clarence Carter classic "Snatching It Back" to open this CD. His refreshing version can certainly stand alongside Carter's, and treats us to an arrangement that is late 1960s Muscle Shoals (the home of the original). The next track, "Midnight Hour Blues," shows off Clark's excellent vocals and guitar work, and is followed by another great cover "I've Been Searching," a 1974 hit for O.V. Wright and one that certainly rivals the Hi Records original. The horn section, led by Mark "Kaz" Kazanoff, cooks throughout this release, giving an authenticity to it that few releases achieve. Their love of this great music shines on each track and reveals how eternal so many of these classic songs are. "Don't Mess Up a Good Thing," a duet with Marcia Ball, rivals the original done by Fontella Bass and Bobby McClure back in 1965. Jimmy Lewis' 1974 "How Long Is A Heartache Supposed To Last?," a deep southern soul anthem that wows us with its intensity, drives W.C. to vocal heights never before hinted at on his three excellent Black Top releases. What a song!! What a singer!! By now I am completely blown away by this release and calling friends to tell them to get themselves a copy. That doesn't happen to me too often. So that this doesn't appear to be just a cover album, please note that W.C. contributed five fine original tracks that all fit nicely into the mix of old and new. "Let It Rain", a Clark original, should get a lot of play on the blues stations. An old Bobby Bland track, "Got Me Where You Want Me," had me digging out the original because, after hearing W.C.'s version, I couldn't believe that anyone could have done a better version. Trust me, this new version is stronger than the original (and I love Bobby Bland). The old Allen Toussaint/Lee Dorsey classic "Get Out Of My Life Woman" is given an admirable reading. With a release that has no weak tracks and many that are simply wonderful, this release will certainly make many top 10 lists for 2002 and, right now, holds the number one position for me. Even though the year is just approaching the halfway mark, I cannot imagine any release knocking this one from the top spot. 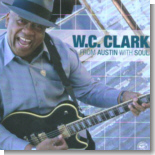 Clark thanks Bruce Iglauer, Alligator's owner, for giving him creative freedom in this release's production and which no doubt elevated this release to this exalted level. From Austin With Soul is an essential purchase for all lover's of great music and soulful singing. The Stax sound lives!